To use the position you are in or at the level that within your career? Do you have hopes of achieving more within your career or finding a job you are truly passionate about question look no further than with Trinity employment agency Tulsa. Our specialists with the Trinity appointment have numerous years of expertise and experience within various industries to help employers hire top talent and candidates find a great job. We want to help connect qualified people with great jobs and work with you to find the right candidate for your company. One of Oklahoma’s highest and most reviewed staffing companies, Trinity employment agency Tulsa is known to provide some of the highest quality services around. We strived to help those who are truly passionate about growing themselves and growing their company with the right people. This is why we work so diligently with you and with candidates to reach your potential success and make your dreams a reality. Whether you may be in the medical field, finance industry, or searching for an industrial job, whichever industry may be an the specialist with Trinity women are here to guide you and help you. We are also extremely passionate about our community and the success of our youth within the community. We believe that our children are our future and that is why we went to help them reach their potential and strive to become the best versions of themselves. We have partnered with Oklahoma Baptist Church working together to feed and provide clothing for children and young adults. We have also been able to provide housing and life skills for these him people. So when it came time to create a giveback program, Trinity employment was on board. Which is why we have been able to successfully create a giveback program for every job placed Trinity will donate to the Oklahoma Baptist children’s home. 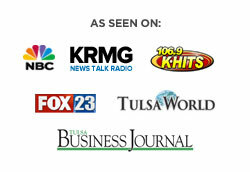 Gone are the days of trying to find the perfect employment agency Tulsa has to offer. The specialist for Trinity employment are here to assist you and guide you with all of your career goals and hiring needs. We strategically recruit talented employees to perfectly meet the needs of your company and connects growing companies with exceptional talent. We truly believe in connecting qualified people who are passionate about the position they are applying for and fit the company’s needs. For more information about job openings within the area in various industries had ever to our website today at https://trinityemployment.com. You can also find an informational podcast providing you with the insights and knowledge when applying for your dream job. We believe in connecting people and changing lives for the better, that is why Trinity employment is the solution and answer your been searching so long for. For additional information about trinity employment or questions you may have, call us today at 918.622.2588. Whether you are searching for a job in the medical field, finance industry, or any particular industrial job, look no further than with Trinity employment agency Tulsa. Our team of specialists had seizures of experience and expertise of what it takes to help pay her you with the perfect company and position that you will be passionate about for many years to come. Known as one of Oklahoma’s highest and most reviewed staffing companies around, Trinity employment is here to help you with all of your career goals and hiring needs. Today is the day to allow yourself to land your dream job or to hire the best candidates for a position within your company. We understand how stressful it can be to weed out the top candidates to perfectly fit the position they were wishing to fulfill. That is why our specialists with Trinity employment agency Tulsa cam provides you with the best expertise of how to evaluate each candidate for the position. We have been able to differentiate the employee who strives to come to work every day and build their career and grow the company as well, versus the employee who only shows up to work to receive their next paycheck. We know how crucial it is to find the top talent to make running things and your company a lot smoother. Our passions don’t just stop there with trying to find top talent and build a career you have always walked for. We also are passionate about our communities youth and helping them reach their potential no matter what background they may come from. We have been able to partner up with Oklahoma Baptist Church working together to feed and provide clothing to children and young adults. We have also successfully provided housing and life skills for these him people. When it came to creating a program we wanted to create one that would give back to our our youth in the community to help them reach their potential. That is why we created a giveback program that entails every job placed Trinity will donate to the Oklahoma Baptist children’s home. Our children are our future and we want to help them strive to reach a bright successful future for themselves and in return provide a bright successful future for our community. With numerous years of experience and expertise the specialist with Trinity employment agency Tulsa strategically recruit talented employees to perfectly meet the needs of your company. We have also been able to successfully connect growing companies with exceptional talent and connect qualified people with great jobs. We want to work with you to find there a career that fits you and the needs and goals within your career. Turn to Trinity appointment today for all of your hiring needs and career goals. To learn more about the various job openings in numerous industries head over two https://trinityemployment.com today. You can also find over on our website the informational podcast provided to help you and guide you through the interviewing process and help you outshine your competition. For any other additional information or questions you may have for Trinity employment, call us today at 918.622.2588.